SmartWebby.com specializes in ASP.net/ASP/PHP programming database-driven (MS SQL Server/MySQL) and ecommerce web solutions. We have programmed numerous websites with user registration and login, surveys, feedback forms, newsletter subscription, client areas, ecommerce capability (product catalog, shopping cart and payment gateway integration), etc. Only three of them are described below. 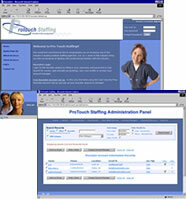 Our client wanted a complete solution for their recruitment company website ProTouchStaffing.com. This website has been build using ASP with MS SQL Server database. We built a completely functional web site where nurses could fill out their skill checklists, search for jobs and schedule interviews and recruiters could search for applicants and post jobs. Search for applicants according to their skills and experience. This website has been build using PHP with MySQL database. 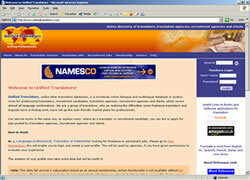 It is a completely functional web site for translators, freelancers or recruitment candidate to bid or apply for jobs posted by translation agencies, recruitment agencies and clients. Unified Translators, unlike other translation databases, is a worldwide online bilingual and multilingual database or auction room for professional translators, recruitment candidates, translation agencies, recruitment agencies and clients, which covers almost all language combinations. This U.S.A based client required a complete database driven website application with complex calculations to provide solar energy solutions for their customers. 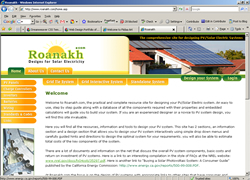 This website was built keeping in mind all the necessary help that visitors would need to estimate and generate their own solar energy. Also programmed in was an extremely user friendly custom built CMS for the client to manage the database.